Shopping Marikenstraat is a lively place. Shoppers and children at play demonstrate that there is a need for an attractive place. 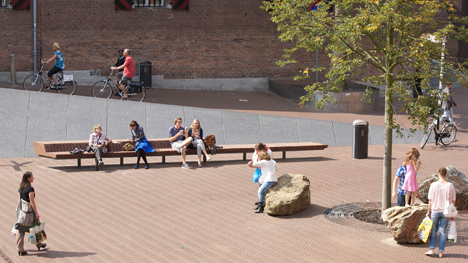 In the design for a bench for this spot we used the present qualities and atmosphere. Characteristic of the current Marienburg is the combination of the historic character with the contemporary design of the shopping area. With its special form, the bank will place a new impetus. The wooden bench is spacious and inviting and can be used simultaneously by multiple people. While shopping here, people just sit quietly and look around or just take something to eat or drink. From the bench shoppers have a view of the Marikenstraat, the bench is at the heart of the open space between the buildings. Here the altitude and direction of streets, squares, stairs and tours come together. The tapered shape of the bench is tailored to the available space and connects with the modern furnishings. He goes from wide to narrow, making it look longer and offering multiple ways of use. The wide part is provided with a low back and armrests for extra comfort. Back support and armrest form a solid whole with the seating because they are formed from glued parts. The use of materials is consistent with materials in the area. The wooden slats are in an oblique direction, a nod to the shutters of the Arsenal. The warmth of the wood reflects the colors of buildings and pavement. The bench can be taken away because of events.